Wars in the 21st century are wars against the earth; against natural resources like water, soil, forests, minerals, seeds. The global corporate economy based on the idea of limitless growth has become a war economy and the means it uses are instruments of war. Trade wars. Waters wars. Food wars. 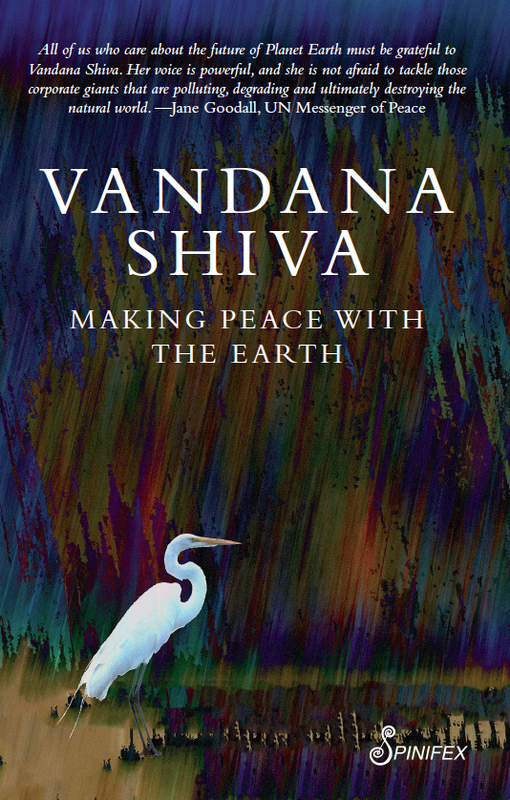 In a compelling and rigorously documented exposition, Vandana Shiva demolishes the myths propagated by corporate globalisation in its pursuit of profit and power, by demonstrating its flawed assumptions and devastating fallouts. Consumerism lubricates the war against the earth, corporate control violates all ethical and ecological limits. It promotes technologies of production based on genetic engineering, geo-engineering and toxins; industrial development that entails the enforced appropriation of land, rivers, mountains; agribusinesses that deplete nature’s diversity; land-grab in Africa, Asia, South America. Exploitation of this order incurs the kind of ecological and economic debt that is unsustainable, unbailable and unbearable. Making Peace with the Earth outlines how a paradigm shift to earth-centred politics and economics is our only chance of survival; and how collective resistance to corporate exploitation can open the way to a new environmentalism of interdependence and earth democracy. Vandana SHIVA is a world-renowned environmental thinker and activist, a leader in the International Forum on Globalisation (IFG) along with Ralph NADER and Jeremy RIFKIN, and of the Slow Food Movement. Director of Navdanya and of the Research Foundation for Science, Technology and Natural Resource Policy, and a tireless crusader for farmers’, peasants’ and women’s rights, she is the author and editor of a score of influential books. Vandana Shiva is the recipient of over 20 international awards, among them the Right Livelihood Award (1993); Medal of the Presidency of the Italian Republic (1998); the Horizon 3000 Award (Austria, 2001); Save the World Award (2009); Sydney Peace Prize (2010); Calgary Peace Prize (Canada, 2011); the Thomas Merton Award (2011); and the John Lennon-Yoko Ono Grant for Peace. Vandana Shiva is currently working on a three-year project with the Government of Bhutan on how to achieve their objective of becoming an organic sovereign country, the first in the world. Vandana SHIVA received the Fukuoka Grand Prize Laureate, 2012. Australian cover of the co-publishing.